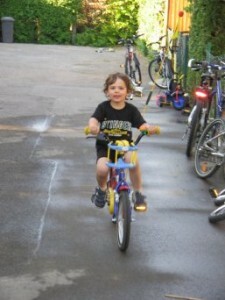 This afternoon Stefan came out with the old bike of his sister and I convinced him to try with my help. That old bike has a handle mounted on the back so that you can hold it easily while waliking alongst it. He tried a bit, but he was not very straight in his movements. Then we had a nice pasta to eat and after that he insisted to try again. I went again beside him and after a few more attempts he was able to go around 3 meters on his own. And then it went on quite fast, not even 5 minutes later he went totally on his own.